We dove into the product mix. With an appetite for more, we dipped into commercial, build-to-suit, office, hotel, industrial, and other mixed-use assets. In 1972, we caught the travel bug. With so much success in the states, we figured why not share our residential and commercial development overseas? We set our sights on Western Europe and the Middle East, where our attractive architecture, attention to detail, and focus on community translated seamlessly. With a new, laser sharp focus on the property management business, things began to shift. Naturally, word got around and a growing number of residential and commercial properties hopped aboard. New clients meant new strategies and workflows that defined our facilities management program. In 2001, we took our next leap and joined forces with the U.S. Department of Defense to re-envision selected bases for the Navy, the Marine Corps, and the Army. By tweaking our strategy we evolved even further to become one of the largest operators of military housing in the country. Even as National leaders, we can’t help but think local. With a host of satellite offices, our management teams know their communities, and deliver appropriately. Our offices are led by senior executives, who are all seasoned real estate professionals that have been at this for quite some time. 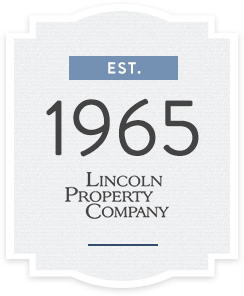 With development and investment properties in more than 200 cities, Lincoln is currently ranked the second largest property manager in the United States. For four decades we’ve been building, evolving, expanding, and learning. In a constant state of momentum, we’re not sure what it means to settle. A company for your lifestyle. We aim to be your comfort zone. From our eager-to-please staff members to modern amenities and sleek designs, we’ve mastered the art of luxury living. A company for your growth and opportunity. As members of the LPC family, you’ve weaved yourselves into the fabric of our foundation, offering individual skillsets and a shared sense of commitment. For this, we thank you. A company for your success. Success feels best when shared. In partnership with LPC, you can rely on us to quickly comprehend, strategize, and follow through on your vision.